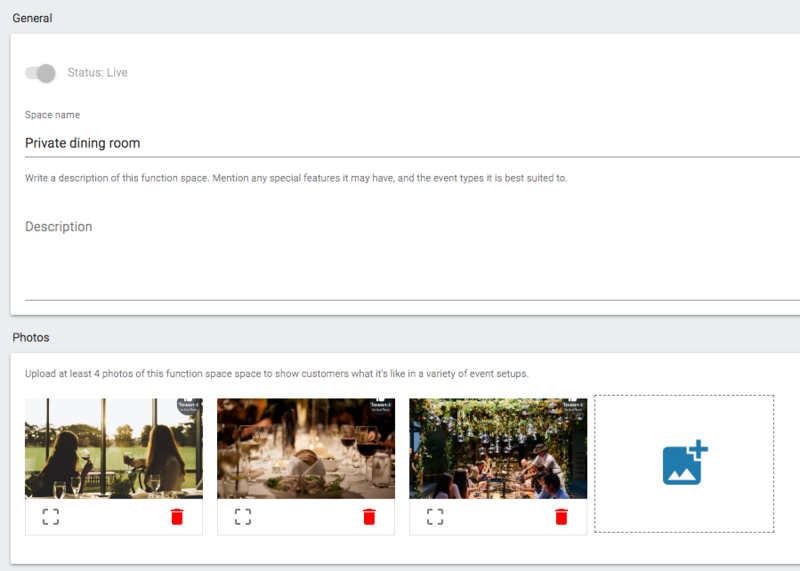 Adding a new function space to your profile. Perhaps you've opened a rooftop for summer, or recently renovated. Adding a new function space to your listing is simple. 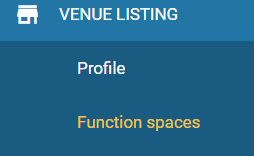 In Venuemob Manager, head to Venue listing > function spaces. Select add a function space, then start populating it with content. Add a space description, and click save. The little icon that says 'Live' means this space is live on your profile. Clicking it over to the left means the space is hidden from public view on your profile. You must have at least one live space per venue. You can add/change/hide space capacities, by clicking on the sliding blue icon. You can also turn on/off the space's facility and feature tags. Remember to click save! Now, add/delete/view images. To add images, click on Upload. You can then load multiple images from your desktop. To delete images, click the trash icon. To view images, click on the eye. You can also change the order by clicking and holding onto an image and moving it around.